With the 29th Pick in the 2017 NHL Entry Draft the Chicago Blackhawks Have Selected Henri Jokiharju From the Portland Winterhawks in the WHL. Jokiharju is a 6 foot, 170 pound right shooting defenseman — a position coveted in the NHL these days. He is originally from Finland and is a naturally gifted puck-mover. Also a solid two-way defender, Jokiharju is an excellent skater with great speed and loads of offensive potential. He transitions from offense to defense easily and is a solid puck handler, all of which he can do at top speed. He has excellent vision and hockey sense, often making the right call in high-pressure situations. Still, to be effective in the NHL, he needs to add upper body strength. He likes to play a physical and aggressive game, but that’s a different animal at the pro level. Getting stronger will help him win those one-on-one puck battles a more force behind his movements will give him a more effective shot from the blue line, which could lead to him seeing time on a top power play unit. Jokiharju played in 71 WHL contests and completed the 2016-17 regular season with 49 points. 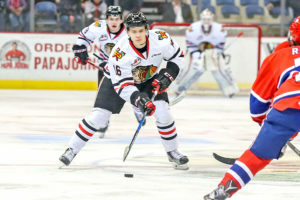 He was the third-highest scoring defenseman on the Winterhawks and scored four goals of his nine goals on the power play. In playoffs for Portland, he added three assists in 11 games. Jokiharju’s biggest asset is his skating ability. He is fluid and shows a good first step as well as solid straight line speed and transitions easily from forward to backwards. He has the mobility to get himself and the puck up the ice and above-average offensive instincts. Adding it all together, Jokiharju is the type of defender you want coming up the ice with the puck on his stick. He has the moves to make a forechecker miss and the puck control to keep it away from the opposition. His passing skills are excellent and his shot is of average velocity but he gets the puck on net with regularity in the offensive zone. It’s never a bad practice to draft someone out of the Portland Winterhawks system. That organization has a reputation for producing high-quality NHL smooth-skating defenders. In fact, they pump out NHL prospects as well, if not better, than almost anyone. The Blackhawks already have Ville Pokka and Gustav Forsling in their system and Jokiharju gives them more depth and a potential area of blue line strength down the road. With the loss of Trevor van Riemsdyk and Niklas Hjarmlsson over the past couple days, this is a good time to be a defensive prospect in Chicago. The team has gotten younger and less expensive and they need their prospects to play a significant role in their organization. The Blackhawks are hoping Jokiharju can do that in the next couple of years.